The monstrance in our Adoration chapel says,"Veni Si Amas." This Latin phrase means, "Come if you love." Jesus invites each of us to follow him more closely - to open ourselves to receiving His love and to give His love to others. 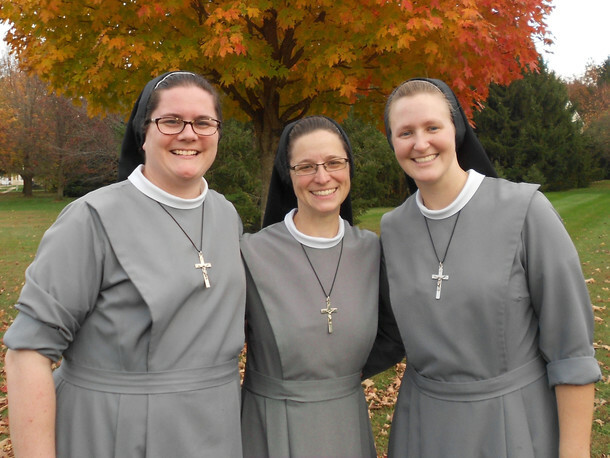 Throughout the year, many young women come in contact with our Religious Community. Many are actively searching out God’s will, listening to His call in their lives. Would you like to do the same? If you are interested in knowing more about our Community, we invite you to complete the Vocational Inquiry. If we let Christ into our lives, we lose nothing, nothing, absolutely nothing of what makes life free, beautiful and great. I say to you, dear young people: Do not be afraid of Christ! He takes nothing away, and he gives you everything. When we give ourselves to him, we receive a hundredfold in return. Yes, open, open wide the doors to Christ – and you will find true life." Heavenly Father, You asked our Mother M. Anselma to be foundress of our congregation of Franciscan Sisters, destined to spread from Thuine to other parts of the world. May her love for You and her willingness to sacrifice all to the Sacred Heart of Your Son inspire many young women to follow Him in our Franciscan community. May her prayers obtain for our candidates the grace to realize in their lives that "For my Lord, nothing is too hard," that they may soon join us with great joy and eagerness. We ask this through Christ, our Lord. Amen.